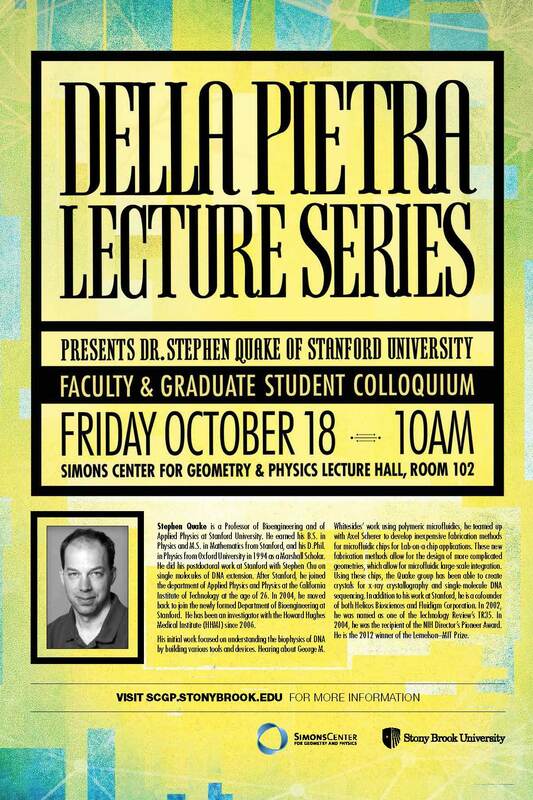 On Thursday, October 17th and Friday October 18th Dr. Stephen Quake, of Stanford University, will deliver three talks for the Della Pietra Lecture Series at the Simons Center for Geometry and Physics, Stony Brook University. 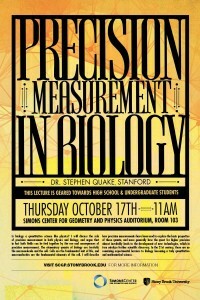 Is biology a quantitative science like physics? 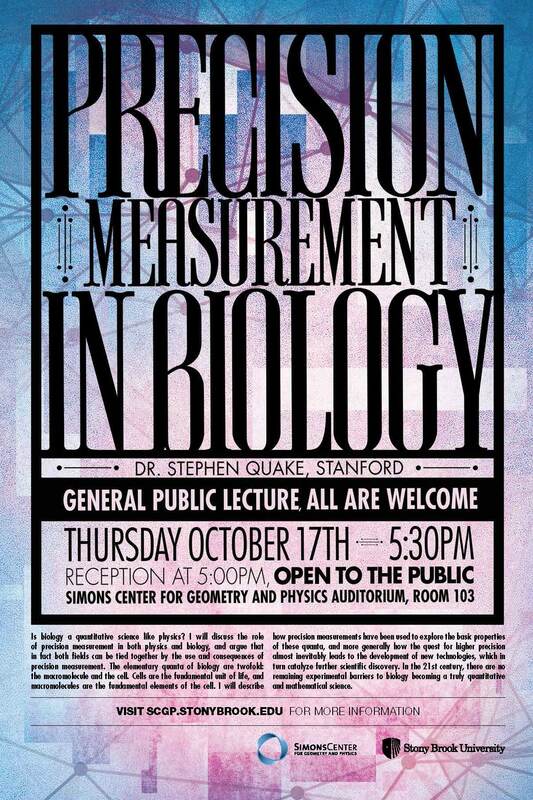 I will discuss the role of precision measurement in both physics and biology, and argue that in fact both fields can be tied together by the use and consequences of precision measurement. The elementary quanta of biology are twofold: the macromolecule and the cell. Cells are the fundamental unit of life, and macromolecules are the fundamental elements of the cell. I will describe how precision measurements have been used to explore the basic properties of these quanta, and more generally how the quest for higher precision almost inevitably leads to the development of new technologies, which in turn catalyze further scientific discovery. In the 21st century, there are no remaining experimental barriers to biology becoming a truly quantitative and mathematical science. 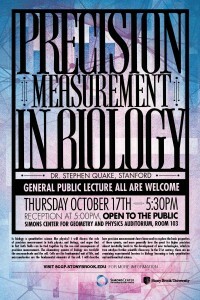 Abstract: Is biology a quantitative science like physics? 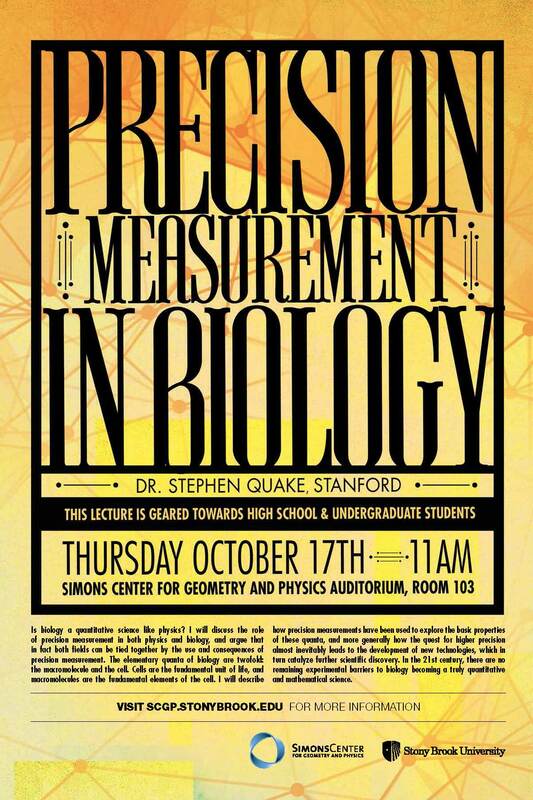 I will discuss the role of precision measurement in both physics and biology, and argue that in fact both fields can be tied together by the use and consequences of precision measurement. The elementary quanta of biology are twofold: the macromolecule and the cell. Cells are the fundamental unit of life, and macromolecules are the fundamental elements of the cell. I will describe how precision measurements have been used to explore the basic properties of these quanta, and more generally how the quest for higher precision almost inevitably leads to the development of new technologies, which in turn catalyze further scientific discovery. In the 21st century, there are no remaining experimental barriers to biology becoming a truly quantitative and mathematical science. 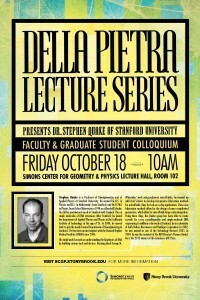 Stephen Quake is a Professor of Bioengineering and of Applied Physics at Stanford University. He earned his B.S. in Physics and M.S. in Mathematics from Stanford, and his D.Phil. in Physics from Oxford University in 1994 as a Marshall Scholar. He did his postdoctoral work at Stanford with Stephen Chu on single molecules of DNA extension. After Stanford, he joined the department of Applied Physics and Physics at the California Institute of Technology at the age of 26. In 2004, he moved back to join the newly formed Department of Bioengineering at Stanford. He has been an investigator with the Howard Hughes Medical Institute (HHMI) since 2006. His initial work focused on understanding the biophysics of DNA by building various tools and devices. Hearing about George M. Whitesides’ work using polymeric microfluidics, he teamed up with Axel Scherer to develop inexpensive fabrication methods for microfluidic chips for Lab-on-a-chip applications. These new fabrication methods allow for the design of more complicated geometries, which allow for microfluidic large-scale integration. Using these chips, the Quake group has been able to create crystals for x-ray crystallography and single-molecule DNA sequencing. In addition to his work at Stanford, he is a cofounder of both Helicos Biosciences and Fluidigm Corporation. In 2002, he was named as one of the Technology Review’s TR35. In 2004, he was the recipient of the NIH Director’s Pioneer Award. He is the 2012 winner of the Lemelson–MIT Prize.